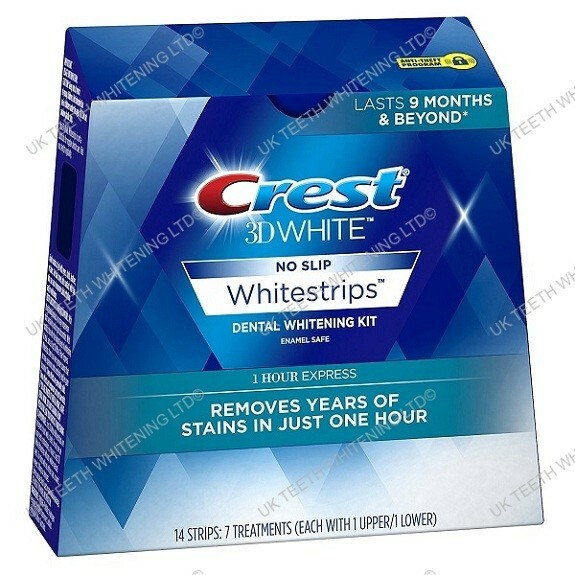 Crest 1 Hour Express White Strips remove years of stains in just 1 hour. These are the ideal whitening strip if you are looking for fast results. Using Crest Advanced Seal Technology you can wear these strips on the go without worrying about them slipping off your teeth. 2 strips = 1 treatment. Whitens teeth faster than ever, even when there’s no time to plan. Use Crest 3D White 1-Hour Express Whitestrips for noticeably whiter teeth in just 1 hour. This kit includes powerful treatments with whitening power that lasts 9 months and beyond. Crest 1-Hour Whitestrips use Advanced Seal, no-slip technology that allows you to talk, drink water and go about your day while you whiten with no sticky mess. They’re also enamel safe and use the same effective whitening ingredient that dentists use.